How far will people go for Valentine’s Day? A study released today by Digitas, a digitally-led, global integrated brand agency, and Brandwatch, a social media monitoring and analytics company, analyzed over 1.6 million social mentions of Valentine’s Day taking place on news and general media sites, blogs, forums, Facebook, and Twitter from November 2012 – February 2013. The findings reveal that more than 45,000 conversations mention travel for the holiday, suggesting that Americans are considering Valentine’s Day a time to vacation away from home and no longer celebrating as just a single day affair. Thirty percent of all travel-related mentions referenced traveling by air, while 37% mentioned traveling by car. Of these two groups, the majority of conversations about air travel were about couples, while groups of friends dominated the conversations about road trips. Our study shows that 70% of people discussing Valentine’s Day travel are considering visits to domestic destinations— the top five being: 1) New York, 2) San Francisco, 3) Chicago, 4) Las Vegas, and 5) Los Angeles. While traveling within the US leads in conversations, a surprising 30% are discussing trips abroad to international destinations. The study shows that when Americans think “Valentine’s Romance,” their top five international destinations are: 1)Paris, 2) London, 3) Barcelona, 4) Sydney and 5) Vancouver. It also appears Americans are preparing for an active Valentine’s Day. Amongst popular activities for vacationing, 42% are looking to relax at the spa as their primary Valentine’s Day activity. Of the remaining, 33% want sun and beach destinations, 21% are hitting the slopes and 4% are wine tasting. Hotels with spas have been advertising heavily online, and our study shows that their online investments are paying off—and not just to the couples celebrating Valentine’s Day. Singles want hotels with spas as well, and for every four mentions interested in a relaxing destination, either by singles or by a couple, at least one included a reference to a coupon or deal. This infographic was annotated using ThingLink to give you an enhanced viewing experience. We wanted to share some of the excitement from Mercedes-Benz Fashion Week through images. Fashion Week is New York City’s single largest media event, which provides top designers an international platform to showcase their collections to more than 100,000 industry insiders from around the world. 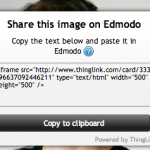 ThingLink allows you to create interactive images enriched with video, sounds, music and more. Now you can also share them on Edmodo to teach, inspire and entertain students as well as teachers. With only a few clicks, you can embed live interactive images on Edmodo for everyone to engage with and learn from. Here are our step by step instructions and you can also watch the video or click through the slide set below. 1. 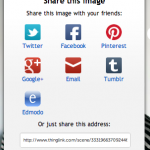 Sign up for ThingLink. It only takes a minute and you can do it with your Facebook, Twitter or email account. 2. Make an interactive image of your own or pick one from the thousands of images that have already been created with ThingLink by using our search function. 3. 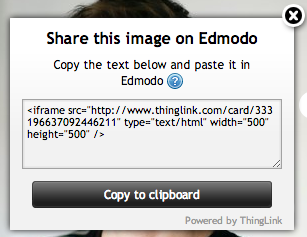 Click on Share image in the top left corner of any image and select Edmodo. You will see an embed script. Click on “Copy to clipboard”. 4. Log in to your Edmodo account. Create a new post and add a link to it. 8. Your live interactive image will now show up in your posts and it can be opened and closed by clicking the attachment icon. or use the search function to find something specific. Discover a treasure trove of innovative ideas and support for using interactive graphics for teaching and learning at the ThingLink Toolkit for Teachers. ThingLink Celebrates Election Day – Now Go Vote! Election day in the U.S. is almost here, and we’re celebrating the right to vote with more awesome ThingLink images. Also read our Oct 25th post. Want to add your voice to the post-election conversation? Make any photo, graphic or infographic ‘touchable” with voice, video and other content. Record a sound message at SoundCloud.com, tag it to any photo, graphic or infographic, and share your image on Facebook or Twitter. Thanks to Susan Oxnevad, Dawn Megli, John, Anna, MadelineS, Richard Hudak, and NKulowiec. Iowa Caucus (by nkulowiec) – a classic from the Republican primary. Want to share your ThingLink election image? Tweet us @ThingLink. Up until now, the poster has been a passive flat surface without any form of interaction but ThingLink users have shown that interactive posters are an artform in themselves: posters have become touchable. Discover how museums, music marketers, political activists, film buffs as well as theatre and film promoters are making use of this new medium. If you have any examples of your own that you want us to highlight – tweet to us with @thinglink and we’ll feature it in our gallery. Halloween happens once a year, but you can celebrate every day with these touchable ThingLink images. Want to make your own? Upload your favorite Halloween image at ThingLink and tag it with sound, video, FlickR photos and the scariest stuff you can find. Check out these Halloween creations by Dafoose, Don McGuire, Theresa Michael, Cortney Harding, Andrew Girwood and Gorizont Newspaper. Planning to blog about holiday gifts? Now you can turn any photo into a touchable holiday gift guide complete with descriptions, purchase links, videos and more. Looking to show your tech geekiness with a gift hint? 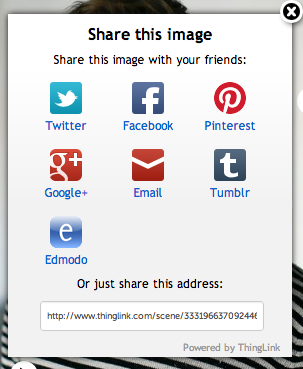 Use ThingLink to tag your favorite gift image with a purchase link… and paste the image link into your Facebook timeline. Whether you’re a journalist, blogger or have your eye on the new Tesla Model S sedan, ThingLink makes recommending, sharing and buying gifts easy and fun. In addition to embedding a touchable image in your blog, you can also post the same image as an APP on a Facebook brand page. Check these touchable gift guides from Jennifer Ramirez, BurdaStyle, Ikea, UMSM, Farfetch, Style Mynt, and Mashable. Want us to feature your Gift Guide? Send a link to social@thinglink.com. I’m lost without maps because my mind is swirling in music. When I started working and driving in San Francisco, using my car GPS to get from one place to another made learning a new city easier. My GPS chirped directions and I followed. With ThingLink, maps can also speak. They can be sound and video players. You can tell a story inside and share the culture of a country. Now, touching maps delivers so much more. Take a look at ways you can enhance maps with ThingLink. Props to Paddy McCabe, Indie Ambassador, Ottawa Star, Soundway Records, Washington Post, Mashable, and Multimediael Universal. Want us to feature your map or image in a post? Send a link to social@thinglink.com. It’s been quite an election year in the U.S. Before the big day this November, we wanted to share our fave ThingLink images by House Speaker John Boehner, Obama for America, Rock the Vote and others. House Speaker John Boehner attacked President Obama on energy. Obama for America – President Barack Obama and First Lady Michelle Obama had dinner with voters. Anna used an infographic to clarify positions on abortion. A Time for Kids offered a fresh view of the election. A phenomenal graphic on the Second Obama vs Romney Debate by Siraj Datoo. And Newshouse reminded us of the 2012 voting deadlines. Whatever your position is, visit Rock the Vote and make sure and register to vote!